What’s the Difference Between Biodegradable & Compostable Packaging? 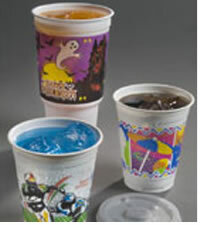 Biodegradable and compostable food packaging refer to materials that can break down and decompose in the environment. This is one of the most reliable ways to conserve the Earth’s vitality while offering customers environmentally sustainable products. While these terms are used interchangeably, they do not share the same meaning. This post will help you know the difference between a biodegradable and compostable product and what to check for whenever a company claims that their product is made from organic materials. So, let’s get started! Biodegradation is a process where natural raw materials can be broken down biologically in the environment within a certain amount of time. If a product is made of organic material, it can be broken down without oxygen and then can be turned into carbon dioxide, water, and biomass with the help of microorganisms. While organic materials in fact do biodegrade in landfills, it’s not within an expected timeframe and may take a long time to decompose. Compostable refers to a natural process where organic waste materials decompose into a substance called compost. This substance is full of rich nutrients that can be used as soil conditioner. The process involves closely controlled heat, moisture levels, and carbon dioxide which accelerates the composting process. Genpak’s compostable material is known as bagasse. It is a renewable, fast-growing resource that breaks down the best in professionally managed compost facilities. How can you tell if a food packaging item is biodegradable or compostable? Just because an item is made, or claimed to be made from organic or natural raw materials, does not mean it will biodegrade or compost. Therefore, it is up to the consumer to do their homework. The best way to make sure that a packaging item is biodegradable or compostable is to ask the manufacturer for a third-party certification document. This certification should be generated from an accredited third party such as the Biodegradable Products Institute (BPI). All of our Harvest Fiber items are third party BPI certified compostable and only apply to professionally managed composting facilities and not your backyard compost pile. To find a composter near you, just visit findacomposter.com. As a leading manufacturer in environmentally sustainable products, we strive to meet your eco-friendly goals. To learn more about our BPI certified compostable Harvest Fiber products, click here. To request free samples, click here. Just when you thought it was big…it gets bigger! The Harvest Fiber family is expanding as environmentally preferable products continue to modernize. The advent of the new HF270 will make you think even bigger. This Jumbo Hinged Container launches as a key trend to the legacy, taking the product line to new heights for consumers, and here’s why. 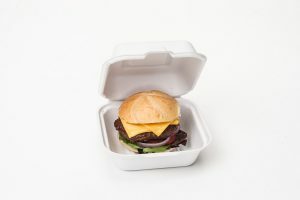 Recent studies from Euromonitor.com have proven the influence of recycling and environmental awareness, which now revolutionizes the demand for compostable and eco-friendly packaging. Fortunately, this product effortlessly alleviates these concerns due to its ecological resources, while also being recognized as BPI certified compostable. Here at Genpak, we engineer the container from a base fiber called bagasse, a by-product of the sugar industry. An exclusive snap-it closure system, moisture resistant technology, and stacking rims for multiple to-go meals are vital features that upgrade the HF270’s catering abilities for some of your largest food choices. You’ll be able to eat big and travel light depending on if you want to grab-n-go, dine-in, or preserve it in the fridge. In other words, it redefines versatility. The HF270 Jumbo Hinged Container currently reigns as the largest hinged container in its family line. You’ll be able to contain everything in it, but your excitement for it will be out of the box! For more information on the HF270 Jumbo Hinged Container, we encourage you to watch our video and request a Free Sample. Earth Day – April 22, 2017 – What are you doing to help? Earth Day is just around the corner on April 22, 2017. Since 1970, Earth Day has been celebrated around the world to support environmental issues across the world. Not only is Earth Day promoting discussion about climate change and sustainable environments, but it also gets people thinking about how their daily lives can make an impact on our Earth. At Genpak, we are committed to helping keep Earth viable for as long as possible. We use annually renewable resources to produce our Harvest Fiber items, post-consumer recycled content in our Deli Containers and Supermarket Containers. 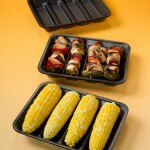 All of our Smart Set Pro and Oven Ready Containers are 100% recyclable. You can learn more about our sustainability efforts in our Green Room. Check out our video to learn more about Harvest Fiber and Earth Day and request free samples. We hope you will participate with us this Earth Day to help keep the Earth around for many generations to come. 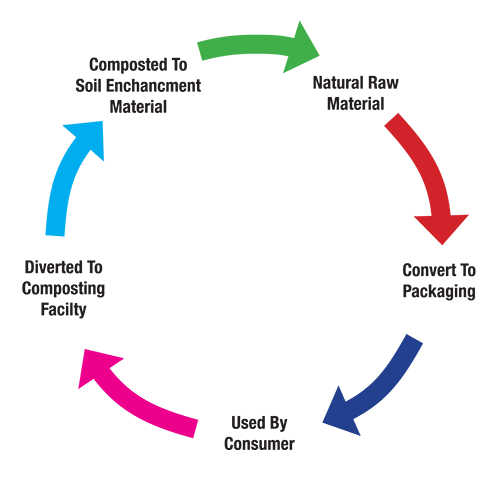 For more information on Earth Day, visit www.earthday.org. Home Delivery Explosion Continues – Are you ready? The home delivery explosion isn’t ending any time soon. Are you ready? Every restaurant should be at least thinking about making this option accessible to their communities. On-demand food service delivery brings food directly from your restaurant to the customers, driven through mobile apps and online ordering. Millennials are driving change in many different areas, food service included. As you might have guessed, Millennials are tech savvy, typically using up to two or three different devices each day. They are using said devices to connect with friends and companies, to research and review products, and to place food orders for delivery or take-out. They already love coming in to your restaurant, so why not connect to them when they don’t feel like eating out. The restaurant industry is a roughly $490 billion market. Food delivery makes up 43% of that marketing and is continuing to grow. Engage with your loyal customers in and out of your restaurant. Millennials and Baby Boomers, alike, want great food at their finger tips. RestaurantBusiness.com has a great article about how to get started with food delivery. There are lots of questions to ask before you get started in offering your food for delivery. Which service should I use, how will this change my business? Are we prepared to take on the increase in take-out orders? Do we have the right packaging for full meals to travel? Genpak is here to help. Take a look at our home delivery video to get free samples, request a call, and learn more. I tried to stay away from posting on all the bans our elected officials like to impose upon us, but I can’t ignore this one since it’s happening in Genpak’s home state. Mayor Michael Bloomberg of New York City, has decided that not only should he ban large soda’s from you, but he’s now going to impose a ban on the vehicle in which you get your drinks. Not only cups, but your hinged containers, soup cups and anything else produced from foamed polystyrene will be banned if he gets his way. 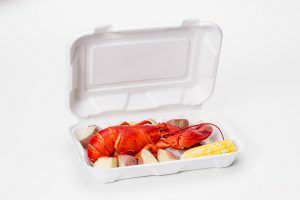 Your bill for whatever you just ordered will go up in price as “green” alternative packaging does not have the same economies of scale as traditional plastics. NYC will trade one type of litter for another. Studies done at municipalities that have banned certain types of plastic in an attempt to reduce litter have found all that has happened is the type of litter has changed from one type of material to another. I’ve no studies to prove this, but knowing a package is “environmentally friendly”, wouldn’t they be even more apt to chuck the hamburger container out the window of their car? The higher cost of alternatives will likely force some food operations to reduce their staff (layoffs) or simply close up shop. The alternative packaging will still go into a landfill where it will stay for years and years. Your taxes will go up. Why? If public schools are forced to move away from their current school tray programs, they’ll be forced to either pay for more expensive trays or buy expensive and costly to run/maintain industrial dishwashers that require a ton of water and chemicals. Who’s going to flip that bill? Taxpayers are. I could go on and on, but suffice it to say these bans do not work. It is a FAR better solution to let the marketplace decide where this goes simply by the actions of the consumer. Not a politician. If consumers decide they want to eat out of a container that is say, compostable, then so be it. Consumers have never been shy in telling their merchants what they want. After all, it’s their hard earned money that’s being spent and merchants in turn will find a way to get it done. The point is, the marketplace is dictating the terms…not a… well you know. Please don’t get me wrong here. We fully support the wishes of the marketplace and long ago have offered 100% natural, fully compostable food packaging. In fact, we have many alternative materials that we offer to our customer base that are either compostable, or source reduced. We would just rather let the marketplace decide on the type of packaging used and not a politician. To say we have been as busy as a beaver on the new product front for quality food packaging, would be the understatement of the year. By my count we launched 50 brand new sku’s just since January. That includes two completely new substrates (material used to make our products), three new product lines and one new category which is single-use cutlery. Yes, I’d say that qualifies as busy. Supermarket Containers – clear APET containers produced from 50% post consumer recycled content which are perfect for salsa and other dips, cut fresh and dried fruit, cut vegetables, gourmet candies, wet salads, olives along with other produce, just to name a few. Harvest Fiber – which is a full line of BPI certified, 100% compostable, food service products. What sets our line apart from the field is our quality, which has always been a trademark of Genpak. 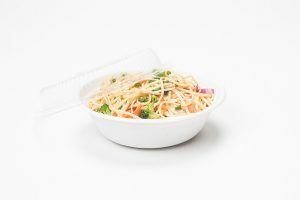 Our hinged food containers are easy to close and stay closed unlike the flimsy containers floating around from our competition, which when trying to close is something akin to threading a needle. It’s all in the design which is our patented, classic Genpak Snap-It closure system. All our Harvest Fiber food service packaging is grease and moisture resistant, 100% natural and as stated previously, BPI certified. That point is important to talk about. Many companies make wild claims of compostability, but unless those claims are backed by an independent 3rd party, they are just empty words. Do your homework. Ask for proof! 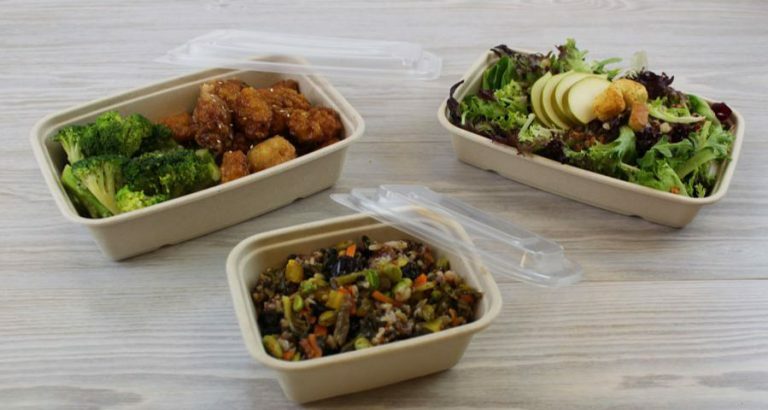 Harvest Starch – is our line of food service plates, bowls, hinged containers and cutlery produced from an environmentally enhanced, hybrid resin that reduces the amount of non-renewable sourced material by 60%! 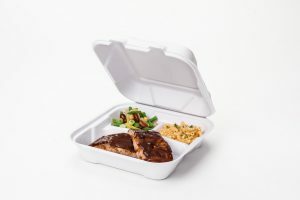 These products fit the bill for those food service operators who want a “greener” option, but still want the look and feel of high-end, traditional plastic products. 95516 – This is an over-cap lid for our single service size oven ready food trays. 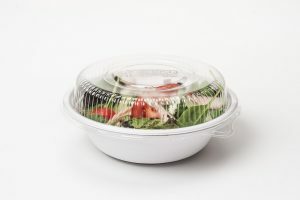 Initially, the two food trays this lid accommodates were designed for film seal applications. However, our customers wanted more flexibility with these trays. Yes, we do listen to our customers (a trait most of our competitors lack) and react to those needs. The result was completely new markets for these products to service. Namely, catered school lunch programs, high end restaurant “doggie bags” and supermarket buffet line containers for foods going into the microwave. So for that, thank you. Smart Set Pro expansion – we introduced a new two compartment rectangular microwave safe food container and a matching lid. The really cool feature of our microwave safe food containers is the unique “textured” finish of the base. The special way we manufacture these products allow us to reduce the part weight but up to 20% versus the heavy, clunky microwave products of our competition. In many circles that is considered a source reduction initiative worth talking about. Of course, with a lower part weight comes a lower price point which is nice too. Corn Tray – Just in time for the summer sweet corn season, we have introduced our TR04 PC “corn tray”. This item is not only good for corn but be perfect for pre-made for shish kabob. That certainly is a pretty busy first 6 months. 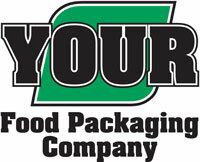 Our goal is, and always has been to be the premier packaging supplier for food service industry. Quality product and quality service.